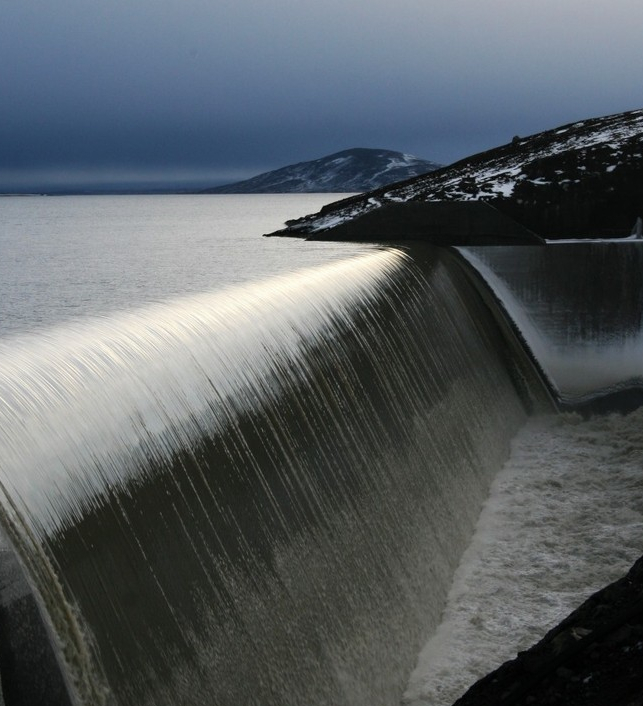 Almost 75% of all electricty consumed in Iceland is generated by hydropower plants. The main source of Iceland’s hydropower are the glacial rivers flowing from Iceland’s glaciers. The largest glaciers are Langjökull and Hofsjökull in the interior, and the massive Vatnajökull in the southeast (note that “jökull” in Icelandic means glacier). 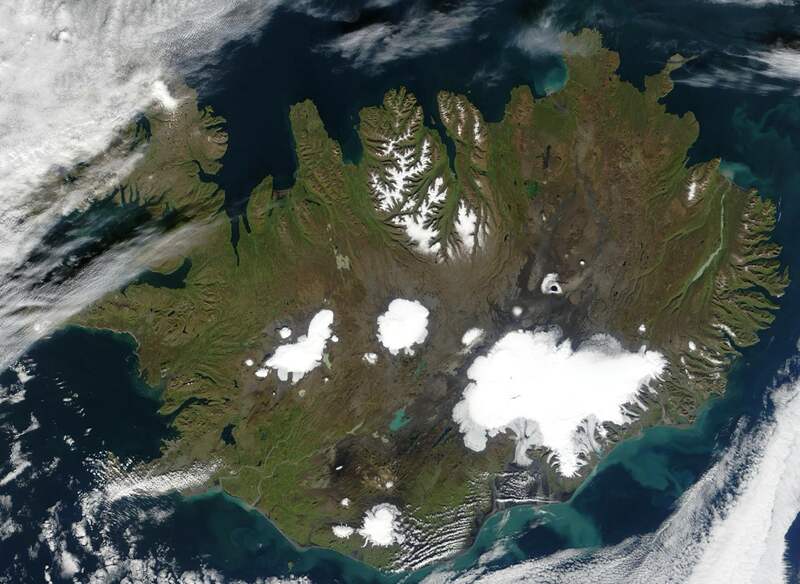 These three glaciers can clearly be seen on the satellite photo of Iceland at left. Also, the smaller Mýrdalsjökull and the infamous Eyjafjallajökull in south Iceland can be seen. The glaciers in Iceland cover more than 1/10 of the total area of the country. Some parts of the glaciers are houndreds of meters thick. Maximum thickness of the ice is cose to one thousand meters (in Vatnajökull, which is the largest glacier in Iceland). Vatnajökull is close to 8,100 sqkm (in comparison, Iceland is 103,000 sqkm). Vatnajökull is the world’s largest glacier apart from Greenland’s ice-sheet and of course Antartica. The glacier itself is now part of Vatnajökull Natonal Park. Iceland’s electricity generation is very stable, thanks to number of large reservoirs with glacial melt water. The largest reservoirs are between 50-90 sq. km and they can often clearly be seen on satellite photos. The largest reservoirs (in areal size) are Þórisvatn (88 sq. km when full), Blöndulón (57 sq. km), Hálslón (57 sq. km) and Hágöngulón (37 sq. km). Þórisvatn is the light-blue lake in southern Iceland that can be seen on the satellite photo above. In winter, some of the reservoirs are covered with ice and snow, as can be seen on the photo at left. the photo shows Hálslón reservoir in the middle of winter. In fact the ice never becomes very thick, but it can snow heavily. Some of the large hydropower stations, dams and reservoirs are quite accessible for travelers. A popular route towards the Icelandic highlands goes past Þórislón and several hydropower plants close by in Þjórsá and Tungnaá rivers. Also, there is a road up to Hálslón and the large Kárhnjúkar dam in the highlands in northeast Iceland. When the Hálslón reservoir becomes full (it normally happens in the period from late July to early September) the water starts to flow over the spillway. From there it falls almost 100 m down to the canyon below, forming a spectacular waterfall called Hverfandi (Vanisher). This year (2012) Hálslón became full on 7th of August.